THIS WILL REALLY BLESS YOU. I'VE BEEN READING THIS SINCE 2002. First, a short biographical sketch. "Charles Haddon Spurgeon (1834-1892) was born in Essex, England. He became a Christian in 1850 (a great story itself) and a year later was the pastor of a small Baptist church. In 1854 he was called to the pastorate of New Park Street Baptist Chapel in Southwark, London. 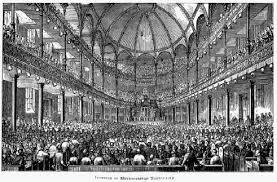 His preaching attracted great crowds, so much so that a new building, The Metropolitan Tabernacle, was erected. During his ministry he built up a congregation which numbered about 6,000. As well as being a popular preacher, Spurgeon was involved in several charitable organisations,including an orphanage at Stockwell. Spurgeon also had an extensive influence through literature, in particular his sermons, which appeared in pamphlet form weekly (called The Penny Pulpit Series, which was distributed in the thousands). He also wrote a commentary on the Psalms entitled Treasury of David, as well as Morning and Evening, a compilation of devotional readings." Taken from the first page of my copy. Click on the tool for better viewing. Thanks for being here. Come twice a day to read and be fed. Now go out and be a blessing!" Here's another Spurgeon source. Here is a really cool one: 32 things you probably don't know about Spurgeon.